A layered hair cut can add body and style to your hair. The layers can also offset a round or long face, giving it more definition. Layers can be added to any length hair, from short to long. If you have short hair, it's relatively simple to add layers to it. You can also go to a professional stylist to add layers to your short hair. Wet your hair thoroughly. Hair is more manageable when wet, making it easier to cut. 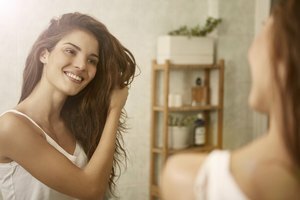 Part your hair where you normally would and comb it straight. Use professional hair scissors to cut hair the same length. Standard scissors are not sharp enough to cleanly cut hair. If you don't use professional hair scissors, you could damage your hair. Separate your hair into three sections. The bottom layer will be closest to your neck. The top section will be the hair that rests on top and around your face. Leave the bottom section as is. This will be your longest layer. Cut the middle section of your hair 1/2 to 1 inch shorter than the bottom layer. 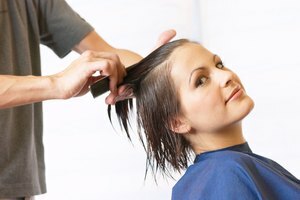 Avoid choppy layers by pulling the hair out so it is perpendicular to your head before cutting it. Hold the hold between your fingers to splay it evenly as you cut it. Take the top section of your hair and cut it 1/2 to 1 inch shorter than the middle section. 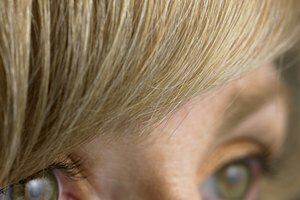 For short hair, the top layers generally fall around your eyes or cheekbones. Enlist the help of a friend if you can't reach the back of your hair.